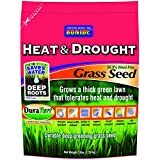 Heat and drought DuraTurf mix of premium grass seed is specially formulated improved turfgrass varieties for heat and drought. Thrives and aggressively spreads to repair thin and bare spots. Improved drought and heat resistance with water saver varieties. Comes with 3-pound.